Advertising gets more and more advanced each year or a decade passes. From static, weatherproof billboards to animated and interactive advertisements, these materials never failed the advertisers in introducing their line of products. So what are these materials by the way? A Digital Signage is an advertising material wherein series of product advertisements are viewed in a customized TV screen, standalone kiosks, touchscreen signage, and many others. 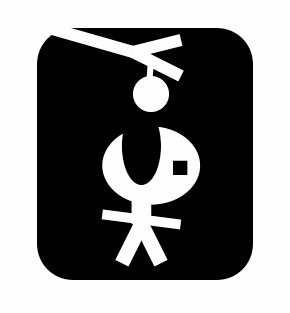 These can be seen in restaurants, stores, malls, even bus and train stations. Unlike the static signage that are just printed and thrown away once the ad is outdated, digital signage is much easier to manage and affordable because advertising companies can just edit the content via desktop computer and transfer it through the signage once completed. It also helps a customer understand the advertised product through a simple slideshow or a short video. Digital Signage in Asia, particularly in the Philippines, becomes more and more aggressive nowadays due to the advancement of technology. In case you didn’t know, when you go to hotels and while waiting, you smell a sweet scent? It is because scent marketing is another good example brought you by WAV Atmospheric. Custom scents are the new paradigm of sensory branding. Fragrance systems and signature fragrances are powerful tools for improving brand recall recognition. Unlike the rest of the 5 senses, our sense of smell is the only one connected directly to the brain. Together with the rest of the limbic system, our sense of smell acts as an emotional switch, which marketers can leverage. Bringing good quality scents may help customers promote the hotel to their friends and colleagues which is a better way of Marketing rather than just describing it through visuals. How WAV Atmospheric transform the Christmas Spirit in the Philippines? During the days of November (or even October), when you entered an establishment, you may feel that Christmas is near because not only the decorations are present, but also the music you hear may also indicate that it’s already Christmas season. Now that’s how WAV Atmospheric do to customers, let them feel and experience Christmas Season by just playing the right sound. WAV Atmospheric supplies instore radio and messaging that ease up the customers five senses through music and other audibles. Customers will feel the comfort while waiting on a long queue or any other task that require long period of time. Restaurants like Sizzling Pepper Steak, Pancake House, and other related restaurants with in-store radio also caters diners the atmospheric music while waiting for 15 minutes before their food will be served on the table. NESCAFÉ Cappuccino definitely the most indulgent coffee ever! Despite the stress at work, problems at home, or any other issues in life, one cup of Nescafe Cappuccino enlightens up your day. Just one cup of Nescafe Cappuccino is very indulgent that you may help you ease up during work, forget your problems at home, and other issues in life. Drinking a cup of this succulent Cappuccino gives you the comfort and indulgence you need. 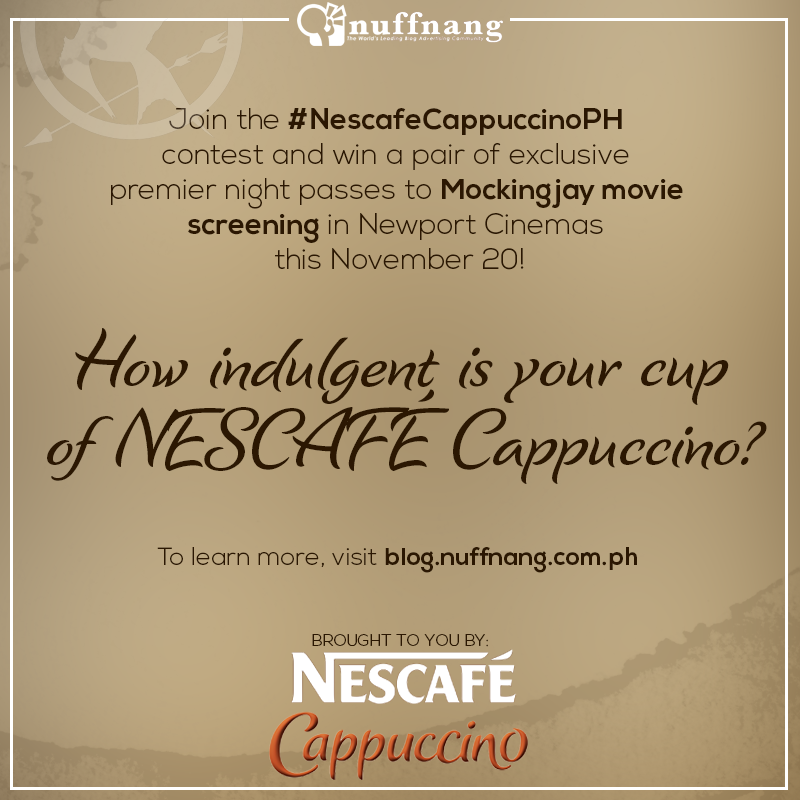 The feeling of indulgence makes me drink 3 to 4 cups of Nescafe Cappuccino a day at work for a reasonable price. Of course, a cappuccino is not complete without the coffee foam and chocolate sprinkles. I sometimes use the sprinkles to draw something, write something, or just put a simple smile on my coffee. So experience the indulgent feeling with Nescafe Cappuccino for a very affordable price on your nearest stores and groceries. I would like to start it of with a delicious treat, my very own Doughnut design care of Krispy Kreme. This was made during the Blogapalooza event. 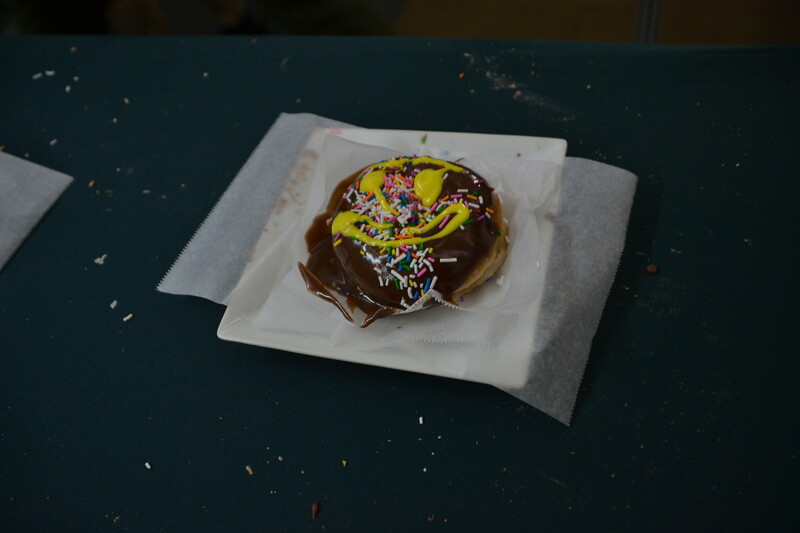 Bloggers and attendees were given a Glazed Doughnut, then they topped it with delicious chocolate syrup, and create your own design by putting the desired toppings on your doughnut. I may not be a very creative blogger but I think this is my masterpiece, a Smiling Krispy Kreme Doughnut. Want to try Krispy Kreme’s delicious doughnuts? Check out Krispy Kreme Philippines’ Official Website now. 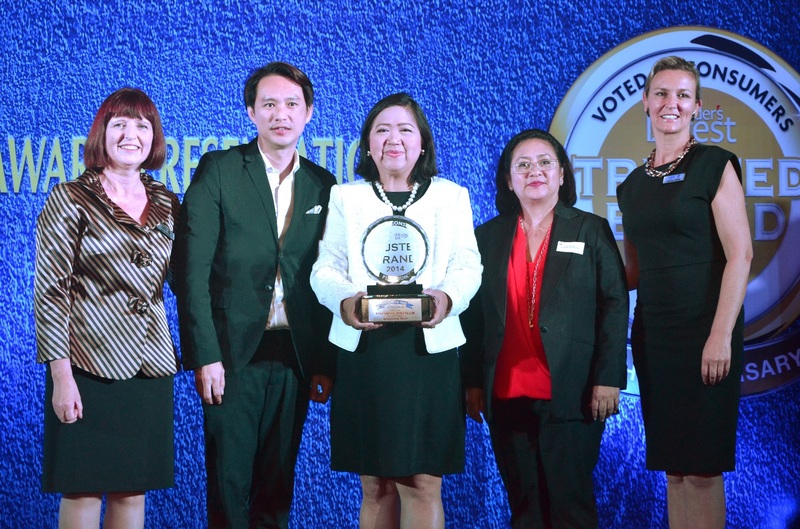 SM Supermalls received the Platinum in the Reader’s Digest Trusted Brand Award 2014 for the Shopping Mall category last June 4, 2014 at Crowne Plaza Manila. (L-R) Sue Carney, Editor-in-Chief, Readers Digest Asia Pacific with the SM Supermalls team, Steven Tan, Senior Vice-President for Operations, Annie Garcia, President, Grace Magno, Vice-President for Advertising and Sheron White, Group Advertising Director, Readers Digest Asia Pacific. SM Supermalls clinched, for the second year, the Platinum in the Reader’s Digest Trusted Brand Award for the Shopping Mall category in the Philippines for 2014. As the ultimate seal of consumer approval, the Trusted Brand Award reflects SM Supermalls’ commitment to trustworthiness and credibility, quality, value, understanding of customer needs, innovation and social responsibility. SM Supermalls adheres to basic tenets of shopping center management rooted in providing the highest level of service and delight to its shoppers which include well-curated local and global fashion brands through partnering with the world’s best retailers; a delectable mix of food tenants giving the market a taste of the best in the local and global scene; a wide array of entertainment options; awe-inspiring architectural eco-friendly designs and a warm ambience that allows shoppers from all walks of life to feel safe, comfortable and happy. Winning this award reaffirms SM Supermalls’ commitment to constant innovation and responsible mall development. The company’s duty goes beyond serving its customers inside the malls as it is also implements sustainability programs benefitting the communities where an SM mall is located. This award motivates SM Supermalls to even work harder in order to maintain the trust its customers have given the brand. And one important reason why SM Supermalls is the Filipinos’ most trusted mall brand is perhaps because it’s never veered away from what it’s been known for through the years – fun and affordable luxury shopping experience. This is what SM Supermalls is all about. In just over five decades, SM Supermalls became the Philippines’ most patronized chain of malls, rapidly growing from just one store into 49 malls in the country, three of which are among the biggest malls in the world. SM Supermalls also owns and operates 5 malls in China. Summer is here and the thing we want for our skin is to lighten our skin, eliminate sun spots, freckles, and other skin pigmentations. But the most important thing is that we need to use only the original kojic acid soap because the original gives the best result we ever need. 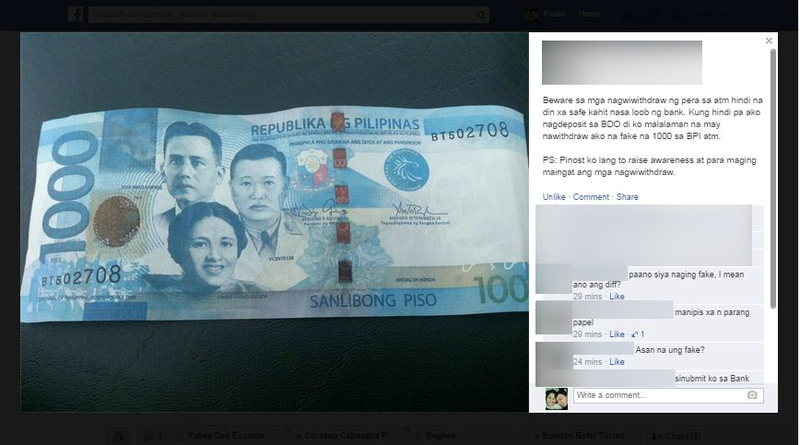 That is why we have Kojie.San, the first kojic acid soap to be commercially available in the Philippine market. 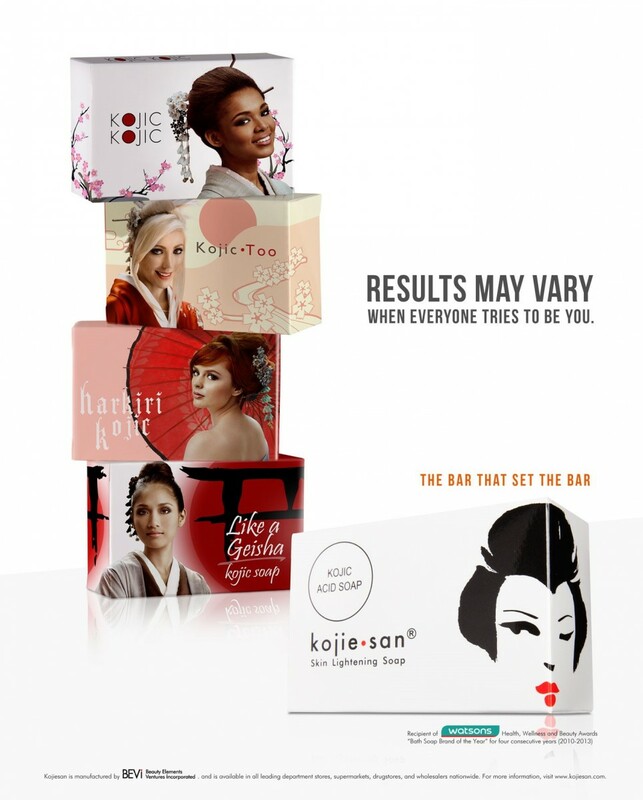 Kojie.san has a micro peeling effect, which makes it a potent whitening product. It contains antioxidants and 100% all natural ingredients. It does not contain any harmful chemicals.